Falmouth gave a little sigh. "Might I point out that you are travelling with a Faerieland Knight, not a fugitive?" she said. "You don't need to sneak about all the time." Darigan Citadel's main and only export is toys. But get those cuddly plushies and bright colors out of your mind, because Darigan Toys are still made with a Darigan demographic in mind. When Charity Corner began, I was turning in cheap plushies and getting rare prizes. This comic went out of date quickly. If there's one person Lily the yellow Ogrin can't stand, it's Jasmine. 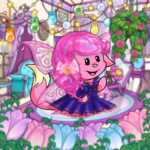 Jasmine is a faerie Uni of the worst kind. Are you sure that's not what you meant?